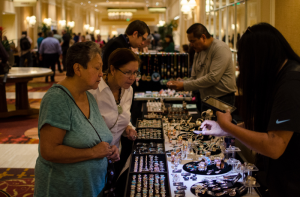 RES 2019 is being held in Las Vegas March 25-28, 2019 and will include the Artisan Market with Native American vendors showcasing their wares. RES provides a unique opportunity for Native American artists to showcase and sell their products at the largest economic summit in Indian Country. This event draws participants and provides an outstanding opportunity to network as well as showcase your products and services to Native American businesses around the country. Artisan booth locations are available on first come first serve basis. There are a limited number of Artisan Market booths available on a first come, first served basis. The Artisan Market sells out quickly. Reserve your booth early to ensure your place at RES 2019! Fee includes (2) two booth attendees. All attendees must be adults. Each booth must be staffed with no less than 1 adult and no more than 2. 1. One booth space is $699.00 for RES. 2. Market times are Monday, March 25 – 9:00 a.m. - 5:00 p.m. | Tuesday, March 26 – 9:00 a.m. - 5:00 p.m. | Wednesday, March 27 – 9:00 a.m. - 5:00 p.m. | Thursday, March 28 – 9:00 a.m. - 5:00 p.m.
3. Fee includes (2) two booth attendees. 4. All attendees must be adults. Each booth must be staffed with no less than 1 adult and no more than 2. 5. Booth fee includes exhibit space access only. DOES NOT include access to any other conference content – Does not include meals, breaks, sessions, or networking events. 6. Booth space includes a choice of the following: (1) 6ft table, (2) chairs and (1) wastebasket or (2) high-top tables with no chairs and (1) wastebasket. 7. Overnight security is not provided and merchandise left at booth is at the discretion of the vendor, NCAIED is not responsible for theft or loss. 8. Food or beverage sales are strictly prohibited. 9. Electricity must be arranged at the vendor’s expense with the Paris Las Vegas Hotel and Casino electrical contractor. 10. All information will be provided in your artisan portal by 02/26/2019 under the Program Guide tab. 11. A $150 early dismantle fee will be incurred by any artisan that dismantles before 1:00 p.m., Thursday, March 28. 12. The Arts and Crafts Act of 1990 (P.L. 101-644) will be enforced, which prohibits misrepresentation in the marketing of Indian arts and crafts products within the United States. The Indian Arts and Crafts Act of 1990 is a truth-in advertising law. It is illegal to offer or display for sale, or sell any art or craft product in a manner that falsely suggests it is Indian produced, an Indian product, or the product of a particular Indian tribe. Violators of the Arts and Crafts Act of 1990 will be asked to leave the marketplace and fees paid will not be reimbursed.